Excellent recipe. I add more salt. This is so simple. I broke in my IP by making two batches of this last night, because I had two chicken carcasses on hand (so, yes, my freezer was getting very full). The first one I made using some clean vegetable trimmings I’d been saving in the freezer, and the second I made using fresh vegetables as you describe in the recipe. The difference in taste was quite noticeable. The first batch tasted slightly “off”—a bit too strongly like old vegetables, especially celery—and had a dark, almost greenish-brown color. The second batch had a much cleaner flavor and a nice golden-brown color, like normal chicken stock. 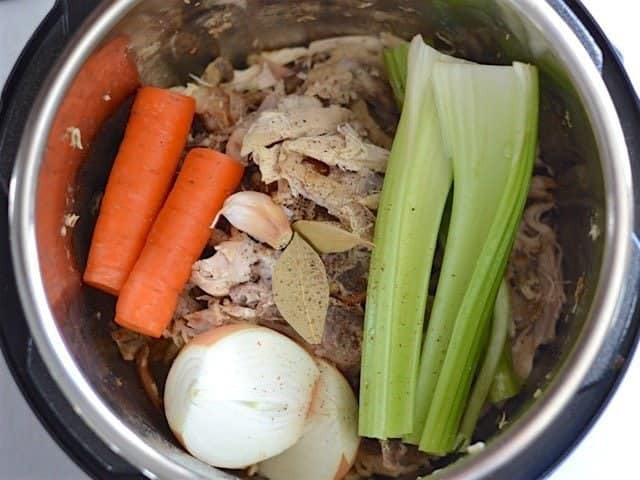 So, as thrifty as it feels to make stock just from vegetable scraps and chicken bones, I think I’ll be using fresh ingredients from here on out. 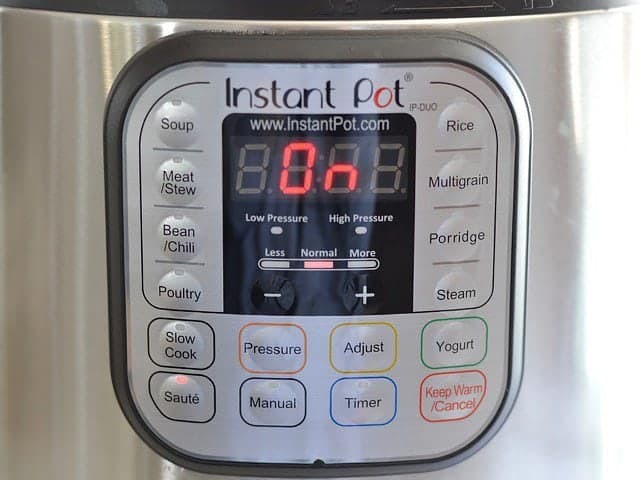 :) But the IP is such a great tool for this—it takes much less time than a slow cooker or a pot on the stove! 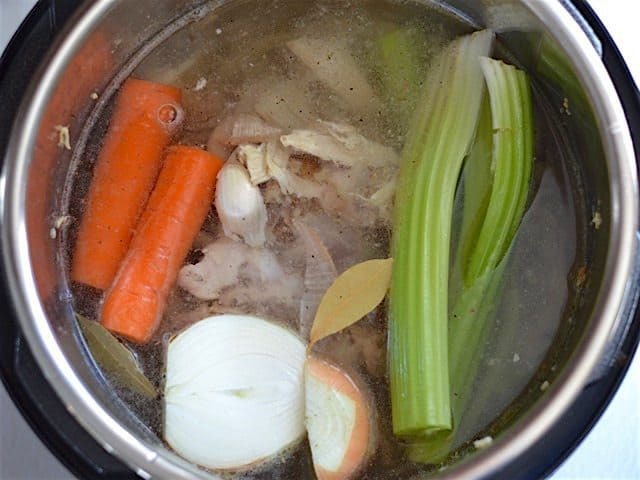 Looking forward to making chicken soup with my delicious stock! 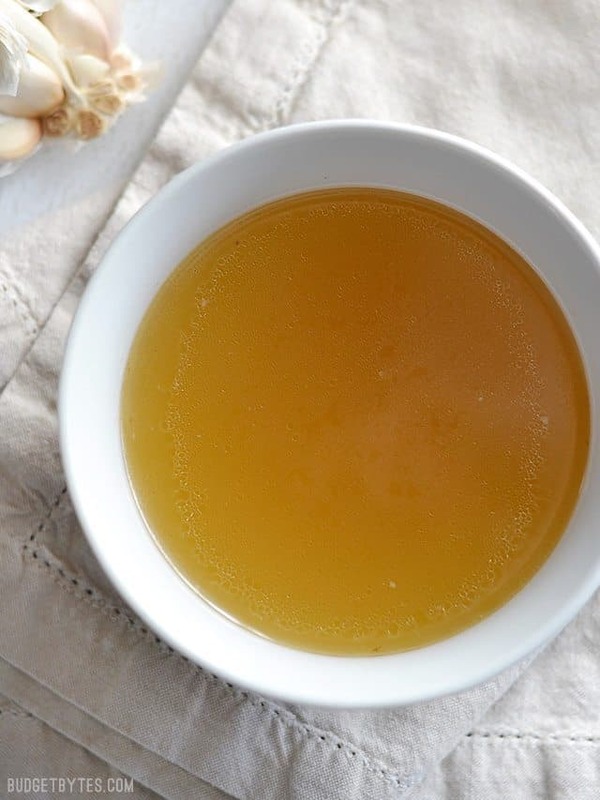 This is the best broth recipe that I’ve used, thanks very much! All I have are raw chicken carcasses, as we get about 10-15 free range cut up and frozen. Should I just cook it longer? I don’t think you’ll necessarily need to cook it longer. The flavor will just be different because roasted bones produce a different flavor than raw. 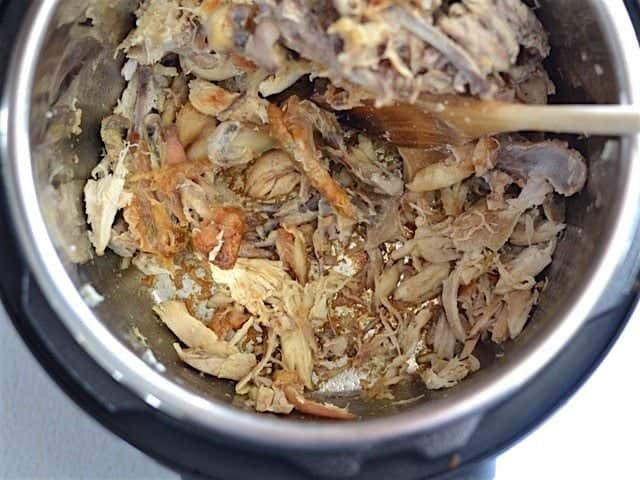 Do you thaw your chicken carcass before cooking in the instant pot? 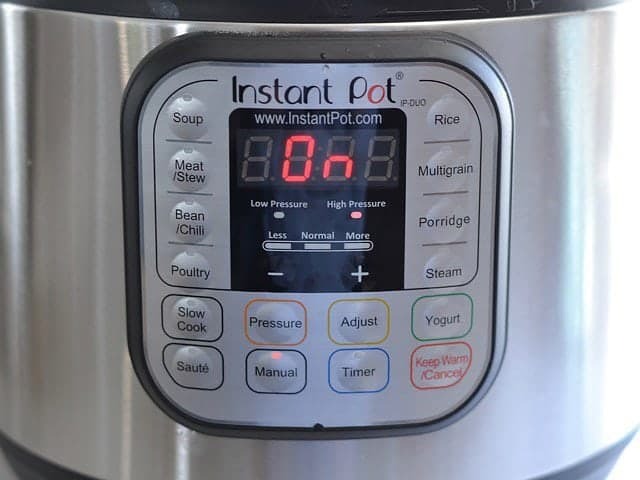 You don’t have to, the IP heats up very quickly and can get the carcass thawed and up to temp within a safe amount of time. I feel the need to comment this on every recipe I try, but I have yet to try something from your site I haven’t loved. Easy, tasty, wallet friendly and for the most part, picky husband approved! 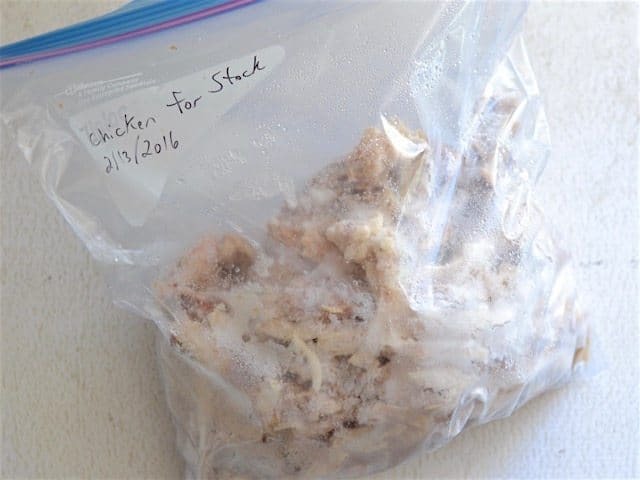 We buy bulk frozen chickens from a local farmer and I usually stuff them with onions, carrots, and celery and put butter, garlic and herbs under the skin and roast them. We save the skin, veggies and carcass and use all that when I make this broth! I add an extra fresh carrot and celery stalk, and some more garlic because my IP is an 8 quart model. I usually don’t bother measuring my water, I just fill to about 1/2” below the 2/3 line on my IP. Mine came out pretty watery and bland.. wonder what i did wrong. I’ve followed this recipe a couple of times and it’s just the best I’ve ever made. 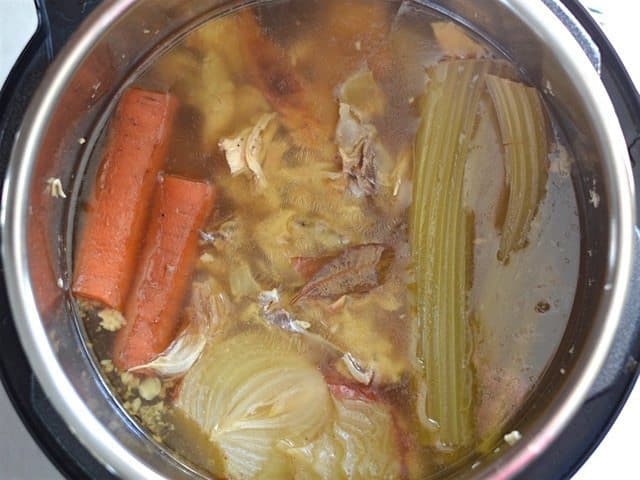 The chicken carcasses I use, are from when my husband “smokes” organic chickens and you can taste that “smoked” flavor in the broth. So tasty on a cold day or when you are getting the sniffles. 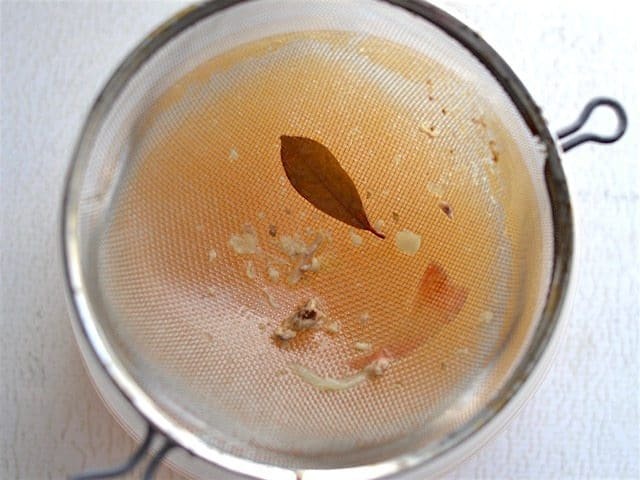 About how much stock does this recipe yield? 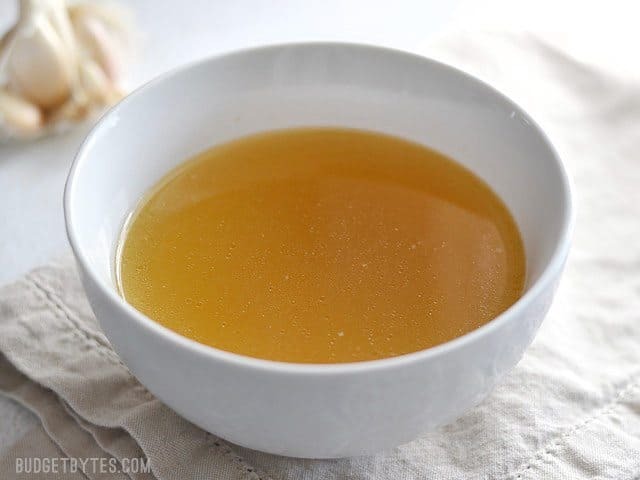 What do you do with chicken from broth? This uses just the carcass, or what is leftover after the meat has been used or eaten. 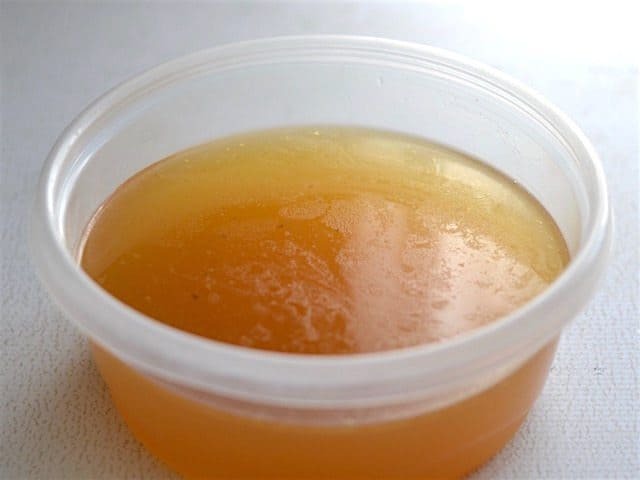 Best chicken stock ever! Since I had the time, I cooked it twice. Adding the salt was key. This is definitely the way to make stock. This came out very bland for me. What can I do to make it richer? 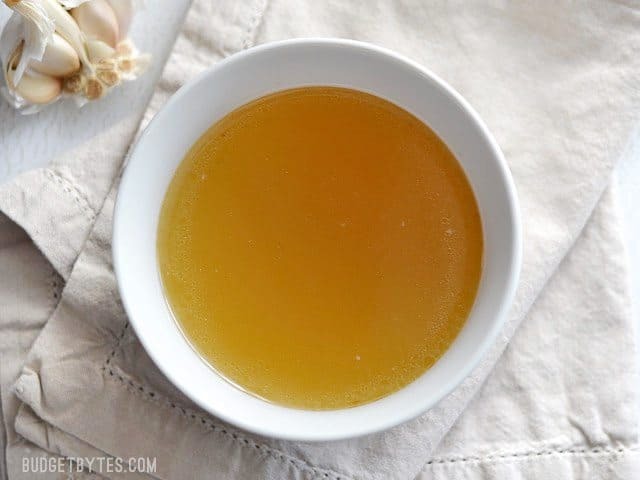 I learned about the health benefits of “Bone Broth” recently. 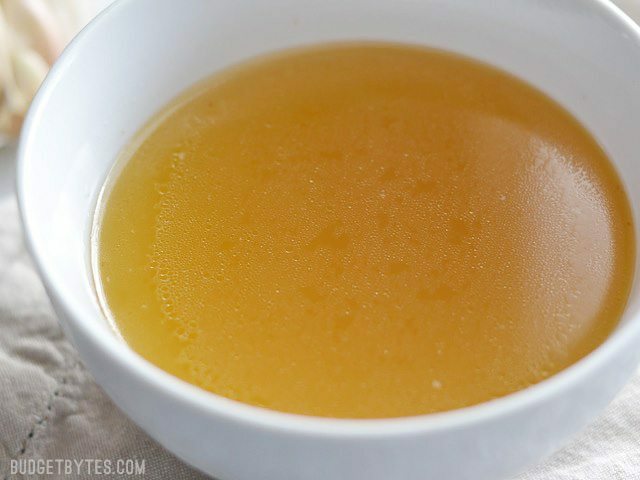 I am not much of a cook, but I wanted to confirm…this is a bone broth, right?? They were talking about drinking a cup daily like you would coffee. I’m not a big coffee drinker and broth is delicious, so I though I might try to make my own and get in the habit of drinking it with some regularity.